Late in a season that’s been anything but, Michigan played a perfect first half on Sunday afternoon. The Wolverines outscored their rivals to the south 39-23 in the opening period and had positive contributions across the board. Late in a season that’s been anything but, Michigan played a perfect first half on Sunday afternoon. The Wolverines outscored their rivals to the south 39-23 in the opening period and had positive contributions across the board. Zak Irvin played his most complete half of the season – passing, rebounding and defending as well as he shot the ball. The Michigan defense, which was shredded in its last two games at the Crisler Center was active, forcing turnovers and cleaning up the defensive glass. Kameron Chatman – who entered the game on a 1 of 10 shooting streak – checked into the game and made three straight shots on an array of moves driving to the basket. Michigan’s inconsistent big men combined for 12 points and six rebounds in the opening frame and even walk-on guard Andrew Dakich buried a corner three. There wasn’t much of anything that Michigan could have done better as it nearly doubled up the Buckeyes just a few days after being embarrassed by Michigan State on its home floor. Michigan couldn’t turn 20 flawless minutes into 40, but while the second half wasn’t nearly as pretty, the Wolverines were just able to hold onto the win. Ohio State managed to cut what was once a 20 point lead down to just three points thanks d a 14-0 Buckeye run midway through the second half. But unlike in previous games during Michigan’s losing streak, the Wolverines got up off the mat and answered the Buckeye run with a few plays of their own. Zak Irvin hit a critical three to push the Michigan lead back to six points with 6:03 to play and a few minutes later Spike Albrecht stripped D’Angelo Russell at midcourt to ice the game in the final minute. Albrecht and Irvin were Michigan’s stars, but nine different Wolverines found the score sheet and 13 of 26 Michigan’s made field goals were assisted. The Wolverines scored a sizzling 1.32 points per possession in the first half, but eventually one of Michigan’s patented scoring droughts reared its ugly head. Has there been a game where Michigan didn’t have an extended drought this season? 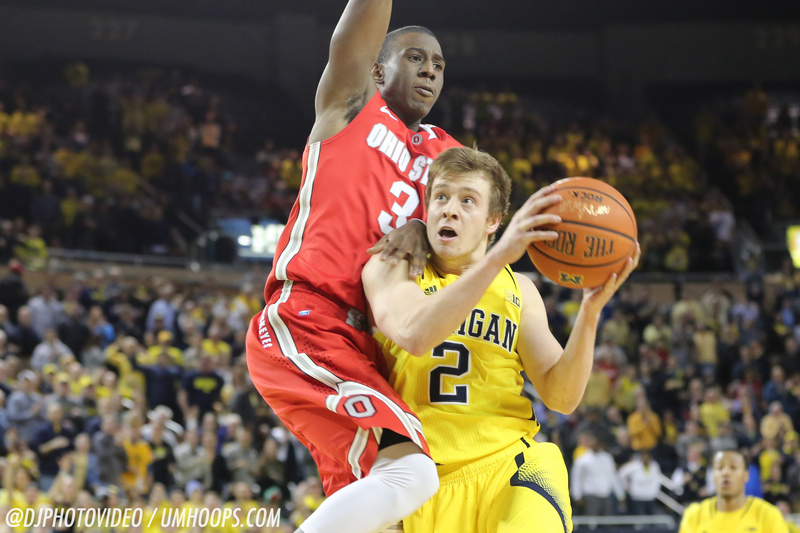 The Wolverines were held scoreless over seven minutes in the second half. Despite that ugly stretch, Michigan’s offense was still very good on the day. The Wolverines scored 1.08 points per possession, shot 53% on twos and 37% on threes for a 53.6% eFG%. Two-point shooting and assists are two of the stronger barometers for U-M’s offensive success and Michigan passed both tests. The Wolverine offense made a concerted effort to get the ball to the roll man or cutters to the rim and as a result only 35% of Michigan’s shot attempts were threes. 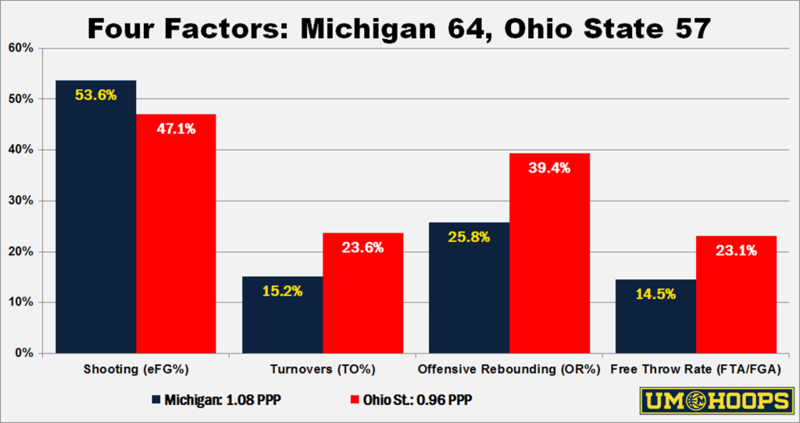 Michigan also valued the ball well against Ohio State’s pressure defense — something that didn’t happen in the first game in Columbus — and the bench scored 18 points in the win. Defensively, this was also a tale of two halves. The Wolverines rebounded 92% of Ohio State’s misses in the first half (allowing just 2 second chance points) before letting the Buckeyes rebound 57% of their misses in the second for 13 second chance points. But at the end of the day, turnovers were the difference defensively. Ohio State gave the ball away on 24% of its trips and many of the giveaways were unforced. Michigan went almost entirely with man-to-man defense – I counted three possessions of 2-3 zone and one in the 1-3-1 – and that was a welcome change. The zone defenses didn’t work against Michigan State and Thad Matta is as familiar with Beilein’s 1-3-1 as anyone. Russell didn’t get much easy offense, a major win for U-M, and Michigan did an adequate job stopping the Buckeyes in transition despite a few slip-ups and communication woes in the first half. This has been a trying season and a trying month, but after slamming their heads against the wall it had to feel good for the Wolverines to finally close out a win. It wasn’t always perfect, but it was also a huge step toward making the NIT and building any sort of positive momentum late in the season. Now the Wolverines have a week off before heading to Maryland on Saturday with a chance for another upset. Visitors: 2016 offeree Seth Towns and 2017 five-star Brian ‘Tugs’ Bowen highlighted the recruiting visitor list along with Damien Jefferson, Jalen Tate and Ibi Watson. Lions defensive tackle Ndamukong Suh (who happens to be Kam Chatman’s cousin) and Big Sean were some of the notable celebrities in attendance. Spike Albrecht: Albrecht’s Trey Burke-esque game-sealing steal was a beauty, but take a step back and realize that Albrecht (16 points, 5 assists, 4 rebounds and 2 steals) is carrying Michigan’s offense against the Big Ten’s best teams. It’s by necessity, but he has emerged as a legitimate scorer and is averaging 13.5 points per game over the last six, reaching double figures in all six — something he did just five times in his career before that stretch. By the end of the game, Ohio State was in all-out ball denial defense to force someone else to run the offense. Albrecht hit timely threes, dropped highlight assists and generally kept Michigan’s offense flowing when there was no one else to do it. Zak Irvin: Irvin played as complete of a game as we’ve seen, finishing with 15 points on 6 of 12 (3-7 3pt) shooting, 7 rebounds and four assists. He hit the critical three-pointer to snap Michigan’s 7 minute drought, but the most impressive parts of his game were his ability to pass off the ball screen and hang in and battle defensively. The growth hasn’t always been steady and might not have been as fast as some hoped — but it’s clear that he is growing as a player despite the tumultuous season. Aubrey Dawkins: By the numbers, there wasn’t a lot to Dawkins’ stat line: 5 points on 2 of 8 shooting (1 of 4 3pt), three rebounds and a turnover in 34 minutes. The play of the game from Dawkins was when he grabbed a rebound in traffic and then beat the Ohio State press by himself, drove to the basket, missed, got the rebound, composed himself and then was able to scoop the ball into the basket for to put Michigan up eight in the final four minutes. It’s not just that he made the eventual basket, but he probably wouldn’t have even wanted the ball in that situation a few weeks ago. Muhammad-Ali Abdur-Rahkman: Abdur-Rahkman didn’t score until the closing seconds of the game, but he didn’t force shots (1-4 fg) and had four very nice assists. He clearly was looking for the drive-and-kick action that just hasn’t been part of his game up to this point and while the passes weren’t perfect, he was finding shooters rather than forcing difficult shots. The freshman also did a great job defensively on D’Angelo Russell, who finished with 16 points on 6 of 15 shooting with 5 turnovers to 2 assists. That’s about as tough of a defensive assignment as there is, but Abdur-Rahkman is really the only option Michigan had to defend him and he managed to stay out of foul trouble. Ricky Doyle: Doyle made some great plays in the first half on the offensive end, but then came down and tweaked his right ankle pretty hard. He scored 8 points on 4 of 7 shooting in 13 minutes, but again didn’t record a defensive rebound (grabbing two on offense). He was clearly limited in the second half and just couldn’t get off the floor (Russell stuffing his dunk attempt had to have been humbling) as effectively. Max Bielfeldt: Bielfeldt had some great plays rolling to the basket, but also a few where he decided a turnaround jumper on the pick and roll was a better approach — it wasn’t. Still, his physicality was critical for Michigan, and he scored 7 points and grabbed 7 boards in just 17 minutes. His hustle down the stretch was also crucial. He grabbed two offensive rebounds on one possession (and then missing the front end of a one-and-one) and then made up for the free throw miss by diving on the floor for a loose ball in the most-important defensive stop of the game. Kameron Chatman: Chatman’s play in the first half was his best shift of the season, at least since the game against Syracuse. He was aggressive with the ball, attacked the rim, hustled and scored. He’s far from a finished product (his second half shift wasn’t great with a wild turnover and an ugly miss), but that stretch in the first half is a reminder that he has potential – he just needs to continue to refine his game. Mark Donnal: Like almost everyone else that stepped on the floor in the first half, Donnal made a positive impact and buried a long jumper. He had a turnover and just one rebound in 10 minutes, but he gave Michigan solid minutes overall. Andrew Dakich: Dakich made his first basket of the season, a corner three, and gave Michigan a solid three minutes off the bench. As Beilein noted in the post game, he’s gotta get back in defense after that make though because U-M gave up a transition three as he was celebrating. Sean Lonergan: I liked Beilein’s decision to give Lonergan a few extra minutes in the first half rather than giving another shift to Dakich, just to spread the bench minutes around.